Cape Town-based Optimal Energy plans to mass produce its fully electric vehicle, Joule, in South Africa from 2012, but we can expect to see pilot fleets on our roads and internationally from next year, the company says. The company has raised the industrialisation capital from a share issue to the Industrial Development Corporation (IDC) and from the Innovation Fund, the technology investment division of the department of science and technology. It intends raising more private capital towards the end of 2009. “Interest in the vehicle has been enormous both at a local and international level,” said Kobus Meiring, Optimal Energy’s CEO. “We are in the process of selecting a site for our first assembly and manufacturing plant. The location of the plant will be announced later this year,” he said. It’s hard to believe, but click on the clip above and you’ll see it for yourself. A 1972 Datsun, which has been lovingly converted into an electric vehicle, can thrash muscle cars on the drag strip. The speedy 37-year-old, named the White Zombie by its owner/creator John Waylands, can reportedly do 0 to 90kph in just 3 seconds. Its internal combustion engine with an output of 69hp has been replaced by a custom-built electric set-up and 60 lead batteries, which produce 300hp. But apparently it’s not the horse power that makes the difference when it comes to electric motors, it’s all in the torque. Electric cars get full torque from the first instant so they can fly out of the starting blocks and leave the competition spluttering in their tyre smoke. I hope this answers at least some of the 17 questions left by Samuel in a comment on an earlier electric car story. California start-up Aptera’s unusual, three-wheeled electric and hybrid-electric cars will be humming along California’s roads from October this year if all goes according to plan. The company apparently has 4,000 customer orders already for its head-turning two-seaters. We’re unlikely to see one in this part of the world any time soon, but they look so futuristic it will be interesting to see how they fare when they become available to the public. The car has been aerodynamically designed to be fuel efficient and is said to do about 42km to the litre. 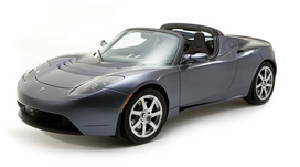 The all electric version will drive for about 160km on one charge, say reports. They are expected to sell for between $20,000 and $45,000. So what do you get for your money ? Well, among the attributes listed on Aptera’s website are the following: the cab is climate controlled, with a bit of help from a solar-cell covered roof; there’s a “cavernous” rear cargo compartment, and the passenger seat can be folded back so you can even fit your surfboard in the car; the seats are covered in fabric made from recycled plastic bottles; oh, and there are two “carefully placed” cupholders. A Beverly Hills plastic surgeon is reportedly being investigated for allegedly using fat liposuctioned from his patients to power his and his girlfriend’s 4×4 vehicles. The Mail Online reports that surgeon Dr Alan Bittern claimed that his patients were happy for their unwanted fat to be put to use as biofuel, which he apparently calls “lipodiesel”. “The vast majority of my patients request that I use their fat for fuel – and I have more fat than I can use,” he is quoted as saying. But it is illegal in the United States to use human medical waste to power vehicles and the doctor – who is believed to have moved to South America – is being investigated by the California health department, the report says. 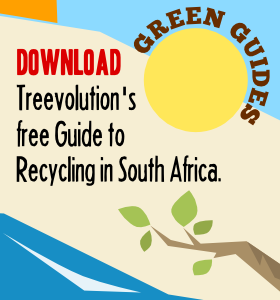 Electric cars are a big favourite on Treevolution. This cute little bubble car is Nissan’s Pivo2. 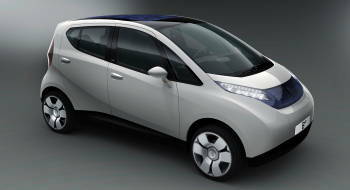 It’s an electric concept car that is on display in an exhibition called “Japan Car. Designs for a Crowded World” that’s showing at London’s Science Museum at the moment. The car is an environmentally friendly urban commuter with a friendly little onboard “robotic agent”. The cabin can rotate 360 degrees, so the driver never needs to reverse and you’ll never have to parallel park again. You can see more pics of the Pivo2 and other cars in the exhibition on Flickr and there’s a video of the Pivo 2 in action on Daily Motion. Hydrogen-powered cars may be in mass production in the next decade, a New York Times article reported recently. Car makers and energy companies in the United States have begun to step up their efforts to develop hydrogen cars and the fuelling infrastructure needed to keep them on the road. Honda is planning to have a hydrogen model in mass production by 2018, says the article. 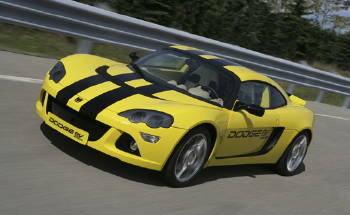 Ford, Daimler, BMW and Volkswagen are also working on prototypes. There’s been something of a stalement, with car makers arguing that there’s no point rolling out hydrogen cars if there isn’t a network of fuelling stations for them and energy companies arguing that there was no point in spending vast sums on creating the fuelling infrastructure when there are hardly any cars on the road. But now, thanks to the volatility of the oil price and the threat of climate change, there’s a new urgency to develop alternative energy technologies. Cars and fuelling stations are to be introduced in “clusters” in urban centres such as Los Angeles, Berlin and Tokyo. For example, in Southern California, Shell has introduced a hydrogen pump at one of its service stations and more are apparently on the cards. At the same time, Honda is leasing about 200 of its FCX Clarity cars over the next three years to selected customers in the region, who will be able to fill their cars up at the Shell service stations. 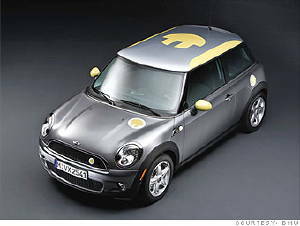 The cars are reportedly being leased for about $600 a month – far less than they would cost to buy. But, encouragingly, there was a huge public interest in the leasing programme. The United States’s National Research Council estimates that there may be two million hydrogen-powered vehicles on the road by 2020. This would represent only 1 percent of all vehicles on the road in the US, but the numbers are expected to rise dramatically after that. A Peugeot 308HDi drove across South Africa on a single tank of diesel last month. The car, driven by two former rally drivers, Andrew Carter and Spotti Woodhead, did the 1,700km trip from Port Nolloth, on the west coast, to Umhlanga, on the east coast, with an impressive fuel consumption of 3,4 litres per kilometre. “The route is incredibly challenging because it climbs more than 1,800 metres and visits substantial cities like Bloemfontein where there is traffic to contend with. We literally didn’t know we would make it until we arrived at the finishing line,” said Carter. Peugeot says it devised the Coast2Coast Challenge to showcase the ultra-efficiency of the medium-sized hatchback 30, and highlight the need for motorists to drive fuel efficiently in order to reduce their impact on the environment. Mike Wilson, Peugeot Motors South Africa’s marketing manager, said: “We knew the 308 HDi was incredibly light on fuel, but we were pleasantly surprised when it pulled up near Durban on the same tank of fuel it had set off with on the other side of South Africa. Carter was a guest on Redi Direko’s show on Talk Radio 702 this week and was talking about the fuel-efficient driving techniques he and Woodhead had used on the trip. To a non-petrol head like myself some of them sounded pretty technical, for instance, try to drive your car at maximum torque because that’s when your engine is at its most efficient (that one sailed way over my head, but apparently you can find out your car’s maximum torque in the user’s manual). There were a few tips that I did understand, though: firstly, you need to learn to be patient behind the wheel (not an easy thing for a Joburg driver), get up to the top gear as quickly as you can without making your engine work too hard – in other words, be gentle on the accelerator, don’t stamp the pedal onto the floor. Although fuel-efficient driving is not about speed, Carter said the car did reach 130km/h at times. He said they tried to pick up speed going down hills so that the momentum could take them most of the way up the other side without having to put much strain on the engine. They didn’t take that long to do the trip: they left Port Nolloth on Monday October 13 and arrived in Umhlanga on Wednesday October 15. The Coast2Coast 308 is apparently 95 percent recyclable and Peugeot has planted trees in the Orange Farm informal settlement near Johannesburg to offset the challenge’s carbon emissions. At the beginning of the year the electric car seemed but a distant dream. But in the past few months there’s been a rash of announcements about new electric cars – even a South African one. We’ve compiled a list of 12 + a plug-in hybrid that we’ve found on the Internet of late. It’ll be interesting to see how many of these make it to market. The ultimate electric sports car, apparently owned by the likes of George Clooney, started to roll off the production line in July. It goes from 0 to 100kph in about 4 seconds, has a top speed of about 200kph and can go for about 400km on one charge – as long as you don’t drive it like a sports car. Tesla Motors says that about 1,200 people have already paid a deposit to reserve the $100,000 car. 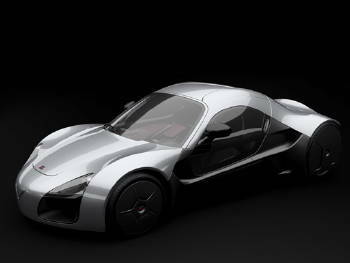 The company has announced that it plans produce a five-passenger luxury sedan powered by a lithium-ion battery pack. The Model S is expected to roll off the assembly line in late 2010. This fully electric babe magnet that was at the Paris Motor Show recently goes from 0-100 in less than 5 seconds. Its top speed is said to be about 250kph and it has a range of 300km (but not at top speed, I’m sure). It looks like it’s planned for production in 2012. Read more at Inhabitat and Venturi Volage. Inhabitat also featured Chrysler’s Dodge EV recently. It says it does 0 to 100kph in five seconds flat, its top speed is about 190kph, and a single charge could last up to 320km – in city driving. The E-Ruf Porsche electric Model A is an all-electric concept car based on the Porsche 997. 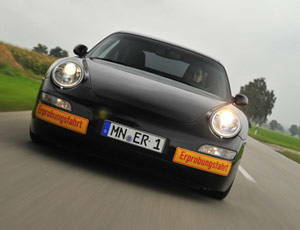 It’s being made by Ruf Automobile GmbH, a German automotive company that tunes Porsches. To get the low-down, visit Road and Track, they took it for a spin and posted lots of pictures. Treehugger also wrote about it. 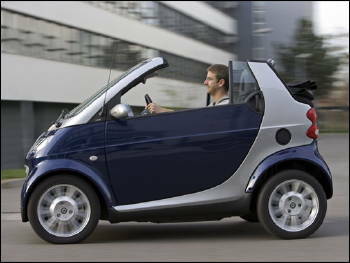 This little car, which is my personal favourite, was also unveiled at this year’s Paris Motor Show. It has a range of 240km and an electronically limited top speed of about 130kph and goes from 0 to 60kph in a time of 6.3 seconds. Read about it on EcoGeek and CarTech. And you can go to Pininfarina’s website to see more pictures. The roof has integrated solar panels and the inside is quite lovely. This one’s pretty unusual-looking, but it does have a certain French elegance. 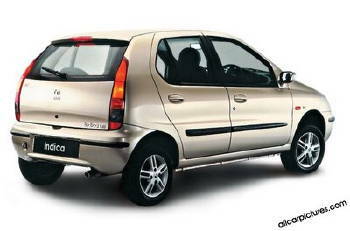 It’s been designed to deal with congested roads and to be easy to park. It seats two people and is, quite remarkably, only 80cm wide. Athough you wouldn’t think it to look at it, the car’s top speed is 130kph, it goes from 0 to 100kph in 8 seconds and it has a range of 150km. I found it on Inhabitat. See more pics on Lumeneo’s website. 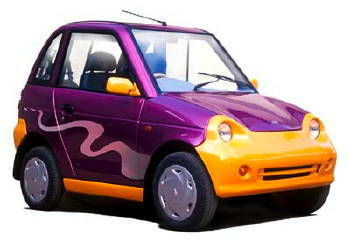 REVA is a battery electric vehicle made by the Reva Electric Car company in India. It is a hatchback and can apparently seat two adults and two children. t’s been commercially available for a while. 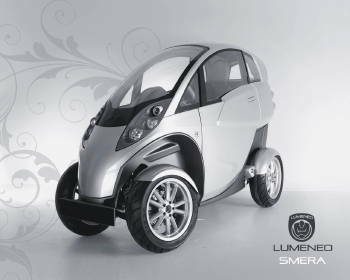 It is designed for low speed, congested, urban conditions and is classified as a quadricycle (category L7e) under UK and European law. In the UK it’s sold as the G Wiz. More on Wikipedia. This car debuted as a concept hybrid that could apparently do “100 miles to the gallon” but a concept Cactus electric car was unveiled at this year’s Paris motor show. The interior of this car is quite something. 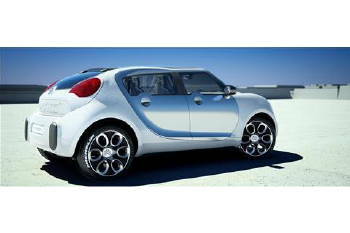 Go to Citroen’s website for some pictures and Smart Planet has written about it. Like the hubcaps. 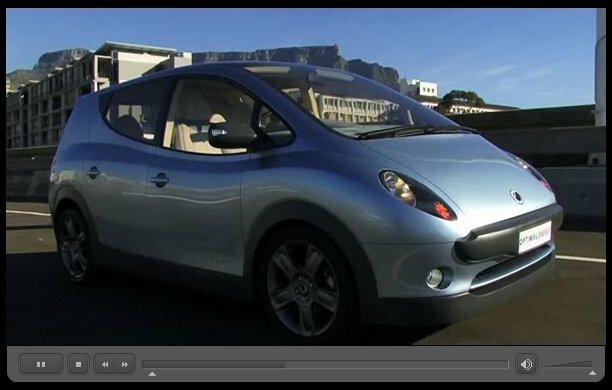 Nearly last but not least is South Africa’s very own Joule electric car. We’ve written about it quite a bit already on this site, but briefly: it goes from 0 to 100kph in 15 seconds; it’s top speed is 130kph and it can go for 400km on a single charge when fitted with two batteries. This one’s not really a totally electric car, it’s more of a plug-in hybrid, although GM doesn’t seem to like to call it that. It has a range of about 60km on the onboard battery, enough for the average American commute, but a conventional engine kicks in for longer journeys. See the Chevrolet website for more info and pics. The Joule’s lithium-ion battery pack will cost about a third of the price of the car (word is the car will sell for around R200,000), so Optimal Energy plans to lease the batteries rather than sell them. A battery is expected to have a lifespan of about seven years. They are recyclable and contain no heavy metals. The car’s overall running costs will be around 20 percent lower than a petrol- or diesel-powered car at today’s fuel prices, and this could increase to as much as a 40 percent saving by the time the vehicle is launched in 2010 if fuel prices continue to rise as expected, according to Optimal Energy. Maintenance costs will be half that of petrol or diesel equivalent vehicles, the company says. The car goes from 0-50km/h in 4.8 seconds and 0-100km/h in 15 seconds. The car is 3.9m long and 1.8m wide, seats six and has a 700-litre boot. It will be available for media test drives next year. The solar-powered cars racing in the South African Solar Challenge have left Cape Town and are on their way up the garden route towards Durbs. You can see pics of some of the vehicles on Urban Sprout and Carbon Copy. They went to see the cars at Canal Walk shopping centre.